William Langewiesche, the author of "American Ground," on life at the World Trade Center site after the towers fell. Michael B. Oren, the author of Six Days of War, talks about how a short but momentous conflict forged the modern Middle East. More on race from The Atlantic Monthly. n the summer of 1988, Richard Rubin, a twenty-one-year-old New Yorker who had just graduated from the University of Pennsylvania, took a job as a reporter at a small newspaper in Greenwood, Mississippi. As he recounts in his new memoir, Confederacy of Silence: A True Tale of the New Old South, he arrived in Greenwood with all the insecurities of someone starting his first job out of college, along with the deeper fear of moving to an unfamiliar city that seemed about as foreign from New York as any place within the same country could possibly be. Greenwood, a major battleground during the civil-rights movement, is an old, decayed cotton town in the middle of the Mississippi Delta, an area that has been called "the most Southern place on Earth." The Greenwood Rubin found was a city of fundamental contradictions—a place that was deeply segregated, with clearly delineated black neighborhoods and white neighborhoods, with restaurants where blacks couldn't go, all-white private schools that sprung up like mushrooms in the wake of the court-ordered desegregation of public schools, and where many whites were openly disdainful of the blacks among them. Yet it was also a place where people could be incredibly warm and friendly, and where most of them readily welcomed a young Jewish man from the North, one who was at times clearly skeptical of their society. I decided, right then and there, that in order to protect both my conscience and my job, I would compartmentalize my encounters with people in Greenwood, separating them from their ideas, and my feelings about them from my actions toward them. Faced with the repugnant and the loathsome, I would entertain my outrage on the inside while remaining, on the outside, inscrutably courteous and genial and above all, silent. Rubin's confederacy of silence enabled him to settle into the Greenwood community, and to get to know the town through a journalist's eyes. Through his job as sports editor, he was quickly initiated into what is perhaps Mississippi's favorite past-time—football. That fall, he became a connoisseur of the Greenwood High Bulldogs, and befriended their new star quarterback, Handy Campbell. Campbell grew up in a housing project in Greenwood, and had never played organized athletics until a friend persuaded him to try out for the football team his senior year. Campbell proved to be a natural who led his team to the state championship, where he showed himself to be Mississippi's best high school quarterback. Throughout all the hype of that season and the fierce competition for him among various Mississippi universities, Campbell remained humble yet quietly confident, a soft-spoken boy who, unlike most in Greenwood, seemed destined to leave his home town and succeed elsewhere. Rubin and many others assumed that some day they would see Campbell playing quarterback in the NFL. Rubin left Greenwood about a year after he arrived, driven away by his rising doubts about the deal of silence he'd made. When he returned to Greenwood, in 1995, it was to see Handy Campbell—who was still making headlines, but now from a jail cell rather than on the football field. Campbell was on trial for murder, a crime that Rubin believed he could not possibly have committed. Rubin's accounting of the trial, which composes the second half of the book, offers a gripping look at the Mississippi justice system, at race relations, and at how disappointment can warp both a person and a whole town. 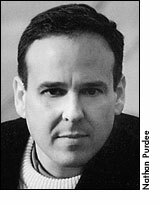 Richard Rubin, who now lives back in New York, has written for The New York Times Magazine, The New Yorker, and other publications. He is the author of Special Collections, a regular feature in The Atlantic. We spoke by phone on July 22. You write that the Delta has been called "the most Southern place on Earth." Did it seem that way to you? And what does being the "most Southern" mean? The Delta is known to some people as the South's South, and it certainly did seem that way to me. To tell you the truth, having just come from a sweep of the deep South during my book tour, it still seems that way. What do I mean by that? First of all it's present in the attitudes of the people who live there, just in terms of their own southernness. I know people in the Delta who don't consider the Carolinas or even Georgia to be the South. I guess the Delta is sort of the South writ large. The landscape is really quite striking. It's flat and brown and extremely humid. The soil of the Delta is extremely fertile—almost more than anywhere else in the country—and so enormous cotton plantations and soybean plantations sprung up there. As a result, the region also gave rise to a planter aristocracy. Let's just say that if there are certain archetypes of the South that you expect to find, you will probably find that they are much larger or more vivid in a place like the Mississippi Delta than they are in, say, Atlanta or Birmingham. Reading the dedication of your book, "To the good people of Mississippi, who treated me like one of their own," I get the impression that the "good" in that is rather pointed. Is that just my interpretation, or did you have that in mind when you wrote it? Well it is to the good people of Mississippi, and I'd say that you have good and bad anywhere. There were people who weren't so kind to me. But I would also say that by and large the people who were not kind to me treated me that way not because I was a Yankee or a New Yorker or a Jew, but because I was a reporter, and some people just don't naturally warm up to reporters. I went down there terrified and not knowing what to expect, and overall I would say I was welcomed quite warmly. I carry that memory with me to this day, very fondly. I think when writing about and trying to capture the essence of any culture or region that seems foreign or strange, there's a danger of caricaturing the people who live there—something you manage to avoid. But was this something you were worried about as you were writing? If so, how did you combat it? Well, I was really worried about it. The South has been dealt with in two ways, which can best be described by citing movies. One is Mississippi Burning. A very grim, stark tale in which it seems that anybody in any position of influence is in the Klan, and it's this giant state wide conspiracy to deprive people of their civil rights and kill anybody who speaks up. And on the other hand, take a movie like Doc Hollywood. That's a movie in which Michael J. Fox is a young doctor who's just finished his residency and is on his way to California to do plastic surgery. His car breaks down in a quaint little town in South Carolina, and they try to convince him to stay, and everybody in town is a colorful character, and there are no racial problems at all, and it's just Eden. Neither one of those is the South. No place could ever live up to either one of those stereotypes. I'm not sure which one I find scarier, to tell you the truth. But, yes, I was extremely concerned about rendering Greenwood as a real place, and rendering the people as real, three-dimensional people—because that is really what the book is about. The central paradox I had to wrestle with was that there are a lot of people, maybe most people, who are at once very good but also in some way very bad. That's real life. It's not neat. But that's the way it is. I really wanted to portray that. And, frankly, I knew that the first thing I would have to do if I wanted to set that tone for the book would be to portray myself accurately. There's a great deal about me in the book that's not at all flattering—my naiveté, my grossly overwritten prose. When I went back and started doing research for this book and started reading my old clips, it was painful to come across that first story I wrote about football. "Friday's game was an excellent example of two teams playing at opposite extremes of their capabilities." Ugh. You did come to Greenwood with a certain wide-eyed innocence about you. Many of the things you found surprising as an outsider wouldn't have been surprising to people who grew up in the South, or at least in the Delta. Were you writing with a certain audience in mind? And do you think that people in the South will read this in the same way that people in the North will? No, I don't. I think that where you come from and what you bring to a book colors how you read it. And I think that people in the South will be reading the book the same way that Americans at the time, for instance, read de Tocqueville. What does the outsider think of us? What does he see? I have to say that one of the most gratifying things about my book tour in the South was meeting people who were very frank with me and said, "I didn't want to like this book, and I didn't even want to read it, but you really won me over." And then I did a radio interview with a fellow up in New York and at the end of the radio show the interviewer told me, "I didn't want to like you, because I thought you were too easy on the South. But you won me over during the interview." I didn't think you were easy on the South. Well, I didn't think I was either. But again, it's a matter of what you bring to it. But yes, I do think people read it differently. I had a great, abiding curiosity about the South that could not be satisfied when I got out of college. There was no book like this. What happened after the civil-rights movement? And that may very well be what people who are not from the South will get out of the book—a glimpse of a place that they probably know very little about unless they've made a point of going there. I would think that going into it a lot of people in the South might have thought, Who is this outsider to come here and write a book about the South? But then again sometimes a fresh perspective helps you see things about a place that you might not see if you've grown up there. Right. I was worried about going on tour in the deep South, because I think there's a natural resistance to northerners writing about the South. Southerners' experience with northerners coming in has not generally been very positive. First you have the Civil War—which obviously didn't work out well for the South. Then you have the civil-rights movement, and a lot of Yankees coming down in the summer, as your typical, entrenched, right-wing southerner saw it, just to stir up the pot, to make trouble where there was no trouble. On the other hand, when I went down there to live and work, it seemed like everybody had gotten together and decided that they were going to kill me with kindness and win me over. I can certainly see why there might be some trepidation about reading a book like mine, in terms of what it might say. But that hasn't prevented people from reading it down there, because I've gotten a lot of feedback. One of the people you worked with at the newspaper once told you, "There's something you just don't realize, when you come down here and start yellin' about the blacks and racism and stirring up all kinds of old stuff that should be dead and buried. You don't see any problem with that, because someday, when you're through here, you're just gonna pick up and move on back to New York or Los Angeles or someplace else. But when you're long gone, I still have to live here ... and so does everybody in this place but you. This is our home; we got no place else to go." To me this seems to hint at an important paradox—that change is much more likely to be pushed by someone who comes in from the outside and has less to lose, yet someone from the outside is inherently less trusted and less able to bring any changes about. Would you agree? I would say that there is certainly that tension there, but it's not completely fair to say that people who are there already don't want change. An awful lot of them do. But if you live in a town like Greenwood, it's hard to rock the boat. It was really hard in the fifties and sixties when the White Citizens' Council, a segregationist organization, was running things, and if you did try to rock the boat, you were quite likely to find yourself friendless and jobless in very short order. I think there's still a certain residual sense that people have an awful lot to lose. If you've grown up in a place like Greenwood, I think you can see its faults and yet at the same time love it dearly and not want to leave. So what do you do, if you want to change things and you're not willing to leave? That puts people in a very hard position. I have a card that somebody gave me who couldn't go to one of my readings. She wrote, "Your book is wonderful"—this is somebody from Greenwood—"I, too participate in a confederacy of silence, but maybe one day I will have the courage to speak up." And that moved me greatly. I feel for this woman. I understand, that's the thing. You have to be careful. I would say that you had it dead right when you said that I had less to lose. The good people who want things to change have to walk a tightrope, and it may take them a while to figure out how to assert themselves. You describe Greenwood as a place where racism is right on the surface. What was it like for you when you went back north to live? Were you more sensitive to inequalities you hadn't seen there before? I would say almost the opposite at first. I'll tell you an experience I had. I was listening to NPR—this was when I still lived in Greenwood—and they did a special about racism at UMass. The people I interviewed said things like, You know, sometimes you go to the cafeteria and all the black kids are sitting at one table, and the white kids are spread out, or sometimes I'll go to a party and I'm the only black person there and I really don't feel comfortable. I found myself getting a little nettled at this. I thought, You think that's racism? You want to see real racism, you should come down to Mississippi. But of course it's all part of the same pie. It took a while for my eyes to adjust, and to be able to see a more subtle shade of racism, but eventually I was able to do it. Of course it had been there all along when I was growing up, but I didn't know what it was. It's a continuous process of evolution, and I think it will still be going on as long as I live and breathe. It seems like one of the things you ran up against down there was that people would have tolerance for you, yet the same people really didn't seem to have tolerance for blacks down there. That's true. Growing up Jewish kind of enabled me to halfway see what it would be like to be a bit of an outsider, though of course I can't compare my experience growing up Jewish in New York to the experience of growing up black in the Delta. I never knew what to do with the fact that I was not just warmly received but really valued in a place like Greenwood, and often by the same people who would completely marginalize blacks in society. I was so young and immature that all I could really do with that was to develop a healthy sense of guilt. I don't know how I would deal with it today. If you know someone who marginalizes blacks and the person is a good friend and someone you feel very comfortable with, then you can tell them, "Look, how is this possible? Why is this the case?" But that doesn't mean that you're going to get an answer that you can use. Because I think that a lot of the time people don't understand it themselves. It's very hard to see around something that you've grown up with. There are people down there who really want to do right and have moments where they see things the way I do, but at other times, they don't. You portray the Mississippi you experienced in 1988, segregated and troubled as it was, as a state that was actually at its "progressive apex." What has happened in the years since then? Why did Mississippi—and perhaps other states as well—lose what momentum it had? Well, I wouldn't necessarily say that it is a Mississippi phenomenon. I don't know whether the country is following Mississippi or vice versa, because the country really did take a sharp turn to the right in the nineties. I would speculate that if you were to go to almost any urban area, you would see that gains in integration that had been made over the previous couple of decades have been at least partially lost. The thing is that in Greenwood the changes were particularly striking, because it's such a small place, and you could see things like the public high school going from being about 50-50 in 1988-89, to today being about 99 percent black. Maybe as we get further away from the intense fights that went on during the civil-rights movement, people kind of settle back into their habits—it's easier to return to patterns that for a while weren't accepted. That's possible. I've had the thought from time to time that the battles of the fifties and sixties were so stark, the good was so obviously good and the bad was so obviously bad—nobody should be killed because they want to vote; nobody should have to get up and sit in the back of the bus just because of the color of their skin; nobody should be denied use of a water fountain on a hot day because of the color of their skin—these things are so self-evident, that nowadays the battles, at least many of them, seem more ambiguous. And maybe we just don't want to be intellectually rigorous. Now that things are not so simple and so cut and dried, maybe it is easier to fall back into the old patterns. You describe your essential dilemma while in Mississippi this way: "People whose minds were shot through with ideas and prejudices I found utterly odious were also some of the best friends I've ever had in my life, people who would have done anything for this New York Jew, even at great cost and perhaps danger to themselves." Are you still wrestling with this dilemma? Have your thoughts on it changed in the twelve years or so since that time in Mississippi? I do still wrestle with it. There are times when I just kind of think, Well, that's the way it is. People are complex. And there are times when that doesn't seem good enough to me. You may remember the moment I had in Parchman penitentiary with the fellow who was leading me on a tour, and he said, "I believe there is some good in every man." That at least allowed me to arrive at the conclusion that this paradox was something that was not unique to Mississippi—it was something that was universal. In a way that made it easier to be in Mississippi and then to remember Mississippi. But the paradox is something I have not resolved, and I don't know what to do with it. Sometimes I take the philosophy that what you really have to do is celebrate the good and expose the bad, even when they occur in the same person. Now, in essence that is what I set out to do in this book. Is that sufficient? I don't know. But at least it sometimes seems like a way of coping. So you see the book as breaking the confederacy of silence that you had when you were down there. Yes, and there's that critical conversation at the end of the book when my boss tells me—it actually took place on my first day in Greenwood, but I don't recount it until the end—"you can have all the opinions you like, but they don't go in my newspaper." In a way this is my chance to air them. Do you feel like he was wrong to ask you that? No, because that's what a newspaper is. A newspaper is supposed to be objective. So I don't think he was wrong at all. I think it was a valuable lesson. I'd like to ask you something about the process of writing the book. You have a lot of great conversations in here that shed light on the personalities of the people you spent time with when you were there. How did you recreate the conversations so long after they happened. Did you keep a journal? I did keep journals. They were conversations I had that I thought to myself as I was having them, I don't want to forget this. I do happen to be very fortunate, in that if I hear something I tend to remember it. Other than that I would say that probably the greatest asset I had in writing the book was my own clips from the Greenwood Commonwealth. I had saved every one of them. They proved to be invaluable in putting this together. Were you thinking at the time that maybe you'd write a book about the experience? No, I really wasn't. I took the job as sort of an entree into the world of journalism. What I thought I would do was climb the newspaper ladder. This is what my boss had told me when he hired me. You start out here, then you move on to a mid-sized paper, and then you can go to the Times. While I was down there it did not occur to me to write a book. I was really just focusing on trying to learn the job and do it as well as I could and get by as best I could in a place like Greenwood. It seems like you had a wealth of interesting conversations while you were there. Oh, yes. There are great conversationalists in Mississippi. You know, Mississippi has a strange reputation because it is last in things like education and median income and health care. It has a reputation for being sort of a third-world country in the middle of America. But my experience is that Mississippi is probably one of the most literate places I've been. A much-praised campaign to teach adults to read is showing other states new ways to attack illiteracy. By Jonathan Maslow You recount how as a reporter for the Greenwood Commonwealth, circulation 9000, "absolutely no one was inaccessible"—from CEOs to state legislators. From the way you describe it, people's attitude toward the press is pretty different down in Mississippi than it is in the country at large. How do you account for that difference? The press is not faceless in Mississippi. If there's a reporter out there, you know the guy. You probably eat lunch at the same restaurant as he does. Mississippi is a state where the population is smaller than that of Brooklyn. It often seemed to me that everybody in Mississippi of a certain socioeconomic background knew each other. It was like a club that I had been welcomed into. So people don't see "the media" except on certain occasions when it suits their purpose to do so. I don't think people are quite as able to see the media as this faceless monster. You know the guy, you know the reporter, or at least you know somebody who knows him. So I would say that that accounts for some of the difference in attitude. But there's been a great backlash against the media since then, and whether or not that has spread to Mississippi I can't say. At one point you express a good deal of ambivalence about doing what it takes to become a "real" reporter—barging in on a scene to get the juicy story. Looking back, what are your thoughts about the type of reporting you did in Greenwood? What sort of reporting do you like to do now? The problems I had were that I often felt I had to invade people's privacy. I was once assigned to go down and interview the parents of a fifteen-year-old kid who had been killed in a car accident, and the idea was so distasteful to me. What was I going to ask these people? How do you feel? What do you think your son would have accomplished if he'd lived? What happened was I ended up driving down to this town and just sitting in my car for about an hour and a half in front of their house. I didn't go up and ring the doorbell, I just turned around and drove back to Greenwood and lied and said that they hadn't been home. I just don't have the stomach for that. I don't really think that's anybody's business. That's the kind of reporting I don't like to do. I'm much happier in a position where I can choose my stories. What sort of stories do you tend to do? I like quirky stuff. I like strange characters and interesting places. I like observational journalism in a way. I don't even know if that's a term or not, but that's what I enjoy doing. I wanted to ask you some questions about Handy Campbell. You went down there as a young reporter, and he was obviously your first big story down there, and I'm wondering how wrapped up you were in the myth of Handy Campbell as opposed to the reality of him. Do you think that others appreciated his talents and personality as much as you did? I think they did. I think his coaches certainly saw his gift the way I did, and his coaches told me repeatedly that he was good enough to play on Sunday. And the head coach at Old Miss said that he had the best arm he'd ever seen. But was my view of Handy Campbell a little romanticized? Certainly, because I did sort of come to see our stories as tied together, in that his career was going to soar and my career was going to soar as well, not with it but in parallel. I empathized with him. We were both these kids who had been given an opportunity that maybe we hadn't deserved. He hadn't played on a team until his senior year in high school, but he had this tremendous raw talent, and I'd been hired to come write for this newspaper with no experience at all but with a respectable college degree. And when he started to do well on the field, I started to do well in the newsroom. So that may well have colored the way I saw him. But not that much. The Handy Campbell I saw was very much the Handy Campbell that most people around him saw. In the end, why do you think a player with such enormous talent didn't make it at Mississippi State or Ole Miss? How much of it had to do with racism and how much with his own actions? I would say it's a good mix. I would say you have two things going on here. You have a system that is going to thwart Handy Campbell's ambitions, and then you have a kid who didn't know what to do with that. He wasn't a sophisticated kid, and he was courted by these colleges, and they made him all kinds of promises when they were trying to get him to sign on with them. Then he gets there and instead of these things coming true, he's benched, and gradually comes to the conclusion that he's never going to be allowed to play. Now, what are you going to do with that? Some kids will say, Well, you know what, I'll use them just like they're using me, and I'll take the scholarship and I won't play, but I'll get an education that I wouldn't be able to get otherwise. Handy Campbell wasn't able to do that. He really wanted to play football. Should he be blamed for reacting badly to that disappointment? I don't know. I can't answer that question, because I can't tell you what I would have done in that position. But I can certainly relate to that frustration. I think a lot of people would have reacted in the way that he did. He acted out. He gave up and he acted out. You know, when you take hope away from somebody, that's a very hard thing to overcome. Katie Bacon is an editor of The Atlantic Online. Her most recent interview was with Michael Oren.